The Skype for Business Web App plug-in is required for audio, video, and screen sharing during a Skype Meeting. If you joined the meeting but can't connect to the Skype Call or can't see meeting content, try the basic troubleshooting steps first, and then review the list of common issues and errors if necessary. Exit the meeting and close all browser windows. Open an InPrivate browsing session in Internet Explorer, a Private window in Firefox or Safari, or an Incognito widow in Chrome. Make sure that your browser allows ActiveX controls to load and run. Click or tap the Join Skype Meeting link in your meeting request. 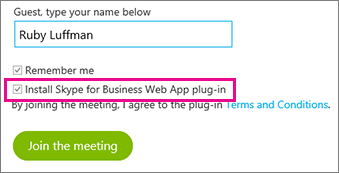 On the sign-in page, make sure Install Skype for Business Web App Plug-in is checked, and then select Join the meeting. In Internet Explorer, at the bottom of the browser window, select Run to install the plug-in. Follow your browser's instructions for installing and running the plug-in. In the Skype for Business Web App Plug-in security alert, select Allow. Tip: If you're able to install the plug-in by following these steps, consider clearing your browser cache to remove obsolete credentials that might be interfering with sign-in. Go to Control Panel > Programs and features, uninstall existing versions of the plug in, and then try signing in again. If you still can’t install the plug-in, review the list of common of issues and errors. Select the Security tab > Custom Level. Scroll down to Downloads and select Enable for File download. Clear Do not save encrypted pages to disk and select OK. Specify a location on your computer to save the file, and then select Save. This issue can also occur if you’ve launched your browser with the Run As Administrator option. Skype for Business Web App is not supported in this environment. To use Skype for Business Web App, launch your browser as a standard user. Select Skype for Business Web App Web App Plug-in from the list of installed programs in Control Panel, and select Uninstall. 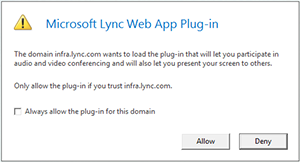 The next time you join a meeting with Skype for Business Web App select Allow to trust the plug-in domain for just that meeting. In TextEdit, delete the line for the domain you want to stop trusting. For example, to stop trusting the domain Contoso.com, delete the line "Skype.Contoso.com"="", and then save your changes. 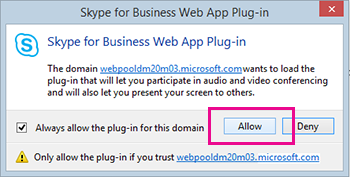 The next time you join a meeting with Skype for Business Web App, make sure Always allow the plug-in for this domain is unchecked before you select Allow.